The Dark Cloud Cove is a two bar formation developing after an up leg, with the first bar continuing a move up and producing a long white body. 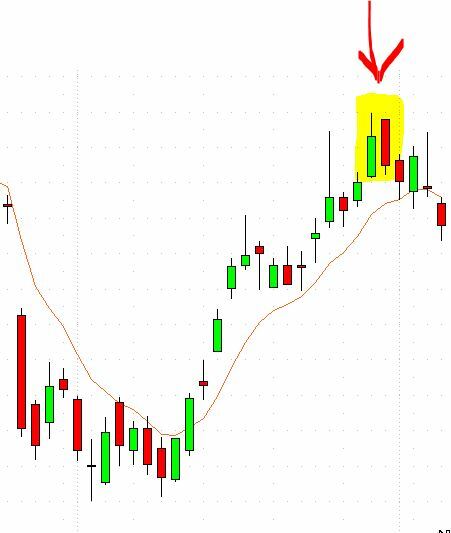 The next bar forms by opening at a new high then closes below the midpoint of the body of the first bar which produces a red down bar. 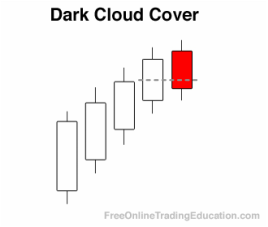 Technical analysts often use the Dark Cloud Cover candlestick pattern to start working their way into a short trade. Most traders need this to form in context with another bearish trade setup as additional trade confirmation. Get 6 (downloadable) trading tutorials emailed to you right now--FREE.